357. 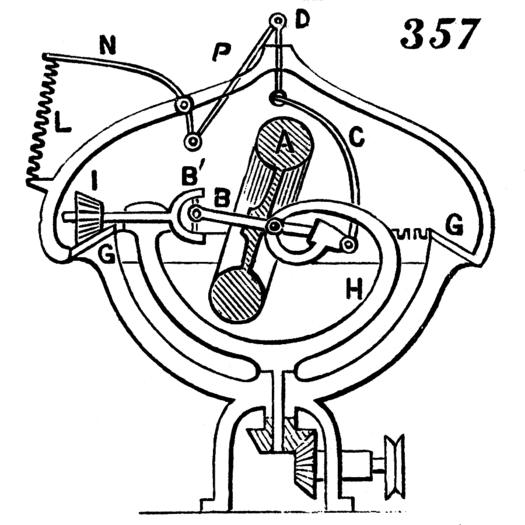 What is called the gyroscope governor, for steam engines, etc., patented by Alban Anderson in 1858. A is a heavy wheel, the axle, B, B1, of which is made in two pieces connected together by a universal joint. The wheel, A, is on one piece, B, and a pinion, I, on the other piece, B1. The piece, B, is connected at its middle by a hinge joint with the revolving frame, H, so that variations in the inclination of the wheel, A, will cause the outer end of the piece, B, to rise and fall. The frame, H, is driven by bevel gearing from the engine, and by that means the pinion, I, is carried round the stationary toothed circle, G, and the wheel, A, is thus made to receive a rapid rotary motion on its axis. When the frame, H, and wheel, A, are in motion, the tendency of the wheel, A, is to assume a vertical position, but this tendency is opposed by a spring, L. The greater the velocity of the governor, the stronger is the tendency above mentioned, and the more it overcomes the force of the spring, and vice versa. The piece, B, is connected with the valve-rod by rods, C, D, and the spring, L, is connected with the said rod by levers, N, and rod, P.